Three of those generations had a president of the Georgia Funeral Directors Association. See the entry for 1941 (my maternal grandfather, Carlos M. Hemperley), 1967 (my uncle, that is, my mother's brother, Carlos M. Hemperley, Jr.), and 1994 (my cousin, Butch, Carlos M. Hemperley, III). But it was not my grandfather who founded the family funeral home, A.C. Hemperley & Sons. It was my great-grandfather, Asa Chester Hemperley. 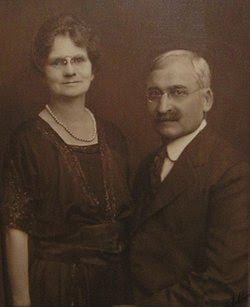 The photo is of "Papa Hemperley" and my great-grandmother, Mattie Travis. The bio of Papa Hemperley at the link mentions that he worked for C.H. Mason Brothers Furniture Company before he went into the funeral business. (The furniture company made caskets, I was told.) The "Mason" of my middle name is in honor of the Mason brothers with whom Papa worked. It is also the middle name of my grandfather, uncle, and cousin, whom I identified above.